Fact action packed Batman extravaganza! The Dark Knight Rises pokies is a blockbuster new release from Microgaming with 243 ways to win per spin set over 5 reels with cinematic graphics, fantastic bonuses and free spins. Enjoy Rolling Reels, Heat Seaking Wilds, symbol scramble and free spins accumulator. This pokies game really brings the Hollywood movie to life with animated symbols and footage from the blockbuster movie. Look out for Batman and Bane as the fight over the reels to award instant free spins and multipliers. The more you play The Dark Knight Rises the more bonuses get unlocked creating more profits in your pocket. Free spins bonus is won when 3 or more of the detonator scatter symbols land. In this feature Batman and Bane will fight in hand-to-hand combat across the screen to provide a greater number of free spins and multipliers. The Dark Knight logo acts as the wild and substitutes for all other symbols except scatter. 5 of a kind with Batman awards 2500 coins while Bane awards 2250. As an added bonus the Wilds can split providing double the payouts. The multi million Microgaming progressive jackpot is linked to the Dark Knight pokie and this jackpot is world renown to hit over $5,000,000. The jackpots are so large when playing pokies games online and they are far greater than those jackpots found on Bitcoin pokie machines. 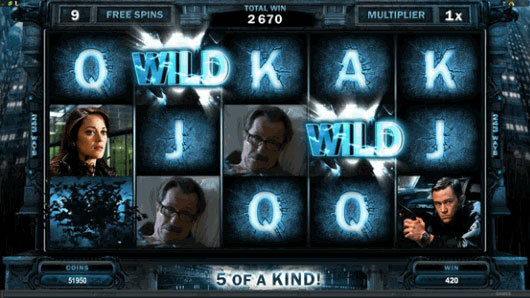 Go on have a spin for yourself on the free pokies version of The Dark Knight Rises and see what all the fuss is about!